Russian officials have begun trashing Western food by the truckload as part of a plan to rid the country of banned fruit, vegetables, meat, fish and dairy products. The actions were recently ordered by Russian President Vladimir Putin after he banned most food imports from the U.S., the European Union, Canada, Australia, and other countries last year. The ban was retaliation for Western sanctions imposed on Russia over its involvement in the Ukraine crisis. Unsurprisingly, critics are outraged by the wastage, saying the food should be used to feed the poor. A petition on Change.org is calling on the government to end this wasteful practice. It has received over 310,000 signatures. Putin ordered that the food be destroyed after Russian producers and farmers complained that the embargo was not being enforced properly. According to the presidential decree, the destruction should be supervised by two officials, and documented in videos and photos. 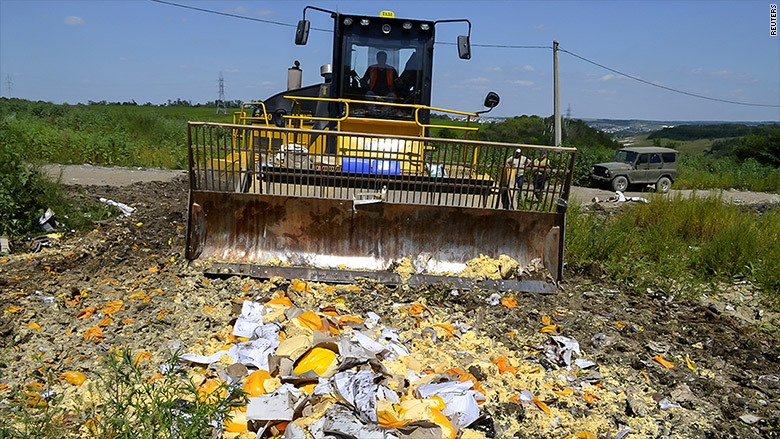 A bulldozer destroys illegally imported food in the Belgorod region in Russia. The decree doesn't specify exactly how the food should be trashed. But photos from Russia show bulldozers squishing cheese, a man throwing ham into a furnace and workers throwing peaches off the back of a truck. 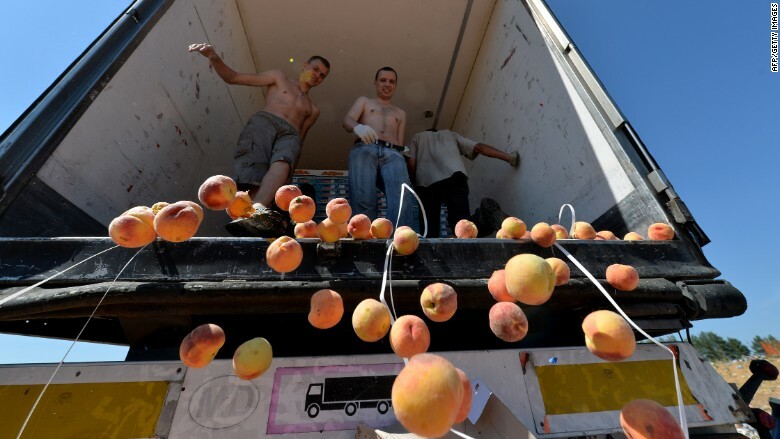 Workers throw peaches off a truck on Friday near Novozybkov, Russia, about 360 miles from Moscow. 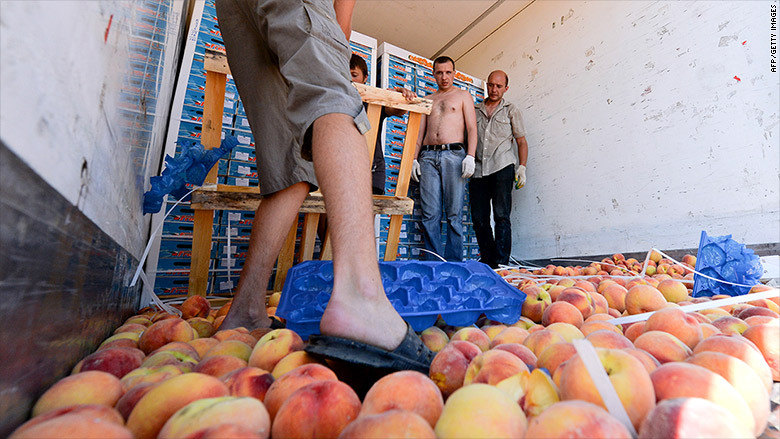 Workers step on peaches as part of Russia's new food destruction program. Border police have also been ordered to start inspecting food warehouses and supermarkets in the hunt for smuggled goods. The ban on commercial food imports has hurt both sides. Russia used to account for about 10% of European exports of food and agricultural products. It imported $13 billion worth of European produce in 2013. However, the European Commission said this week that food exports have been "remarkably resilient" in the year since the Russian embargo was put in place. "In most regions, most of the affected sectors have been able to find alternative markets, either within the EU or beyond," it said in a statement. 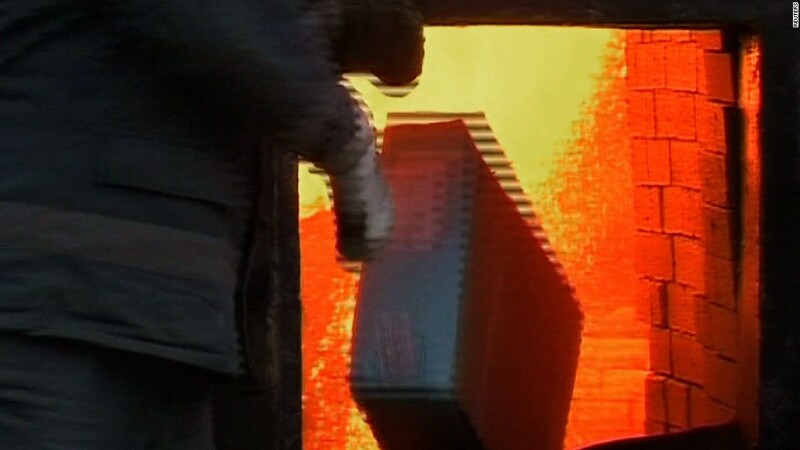 But the EU has still had to help some producers. It has spent around $170 million paying farmers to give away or destroy produce to stop prices from collapsing. 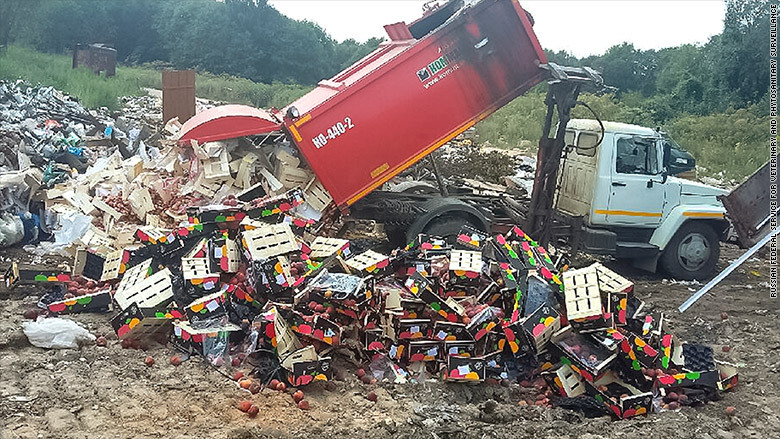 The Russian government published this image of a truck dumping fruit. Russian consumers are feeling the pain too. Food prices in the nation skyrocketed by 20% in the year to July, according to official data.